The third module of “Play with your Music” is about the mixing process: taking individual tracks of recorded instruments and vocals, and arranging them together into a cohesive whole. 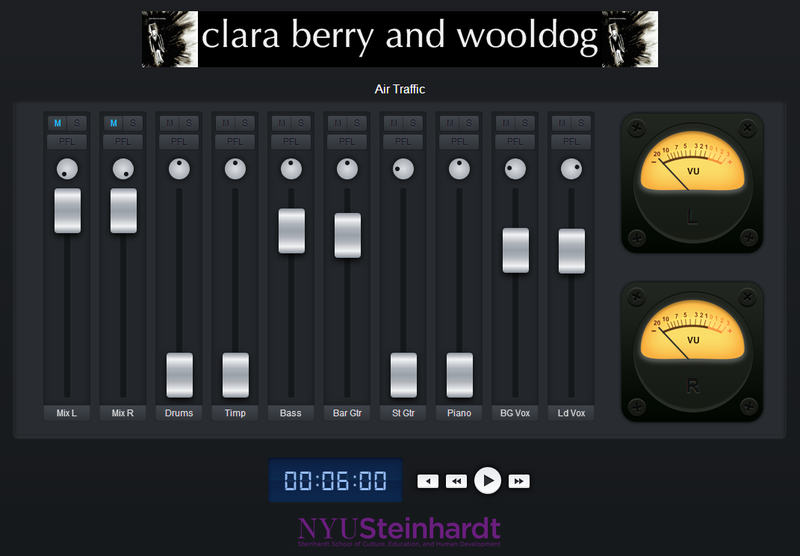 The first part of this week’s assignment was to reproduce Clara Berry & Wooldog’s “Air traffic”, by setting the volume and pan (left-right) for each track. This reproduction is to create a “convergent” mix. The task was to make a static mix, so we’d just have to find a single setting for each track, rather than adjusting things over the course of the track. There was a video on multi-track mixing and a useful interview with the musicians, producer and engineer involved in the creation of “Air traffic”. Alex Ruthmann has a good interview technique, and challenged the interviewees to unpack things that were obvious to them but not to mixing novices. The most fun part of this week was being given the chance to come up with a different version of the mix. I moved background vocals to the left channel, and lead vocals to the right channel, so that they could have more of a duet feel. Initially I made the background vocals louder than the lead vocals, to see what that would sound like. But this sounded a bit too strong, so I turned the volume of these down, so that left and right vocals were now equal. I love the drum entrance, but keeping the drums at the same level for the whole mix, as we’re doing in this static mix exercise, made things feel too abrupt when certain elements appeared. And I didn’t want them vaguely-present, but not loud enough to listen to closely. So I stripped the drums out entirely. I then tried to focus in on the timpani, which I’d set to about half of max volume and forgotten about while I worked on the more important elements. I couldn’t hear it very clearly, so I maxed out its volume and listened to its contribution to the mix. It only makes a few appearances – in a way, it’s a frame for the drums – and sounded a bit disjointed without some of the other embellishments that I’d removed, so I got rid of it too. I gave the mix another few spins, and decided that the bass was set a bit loud. So I turned the bass down a bit. Have a listen to my divergent mix of “Air Traffic”. 1) I didn’t actually receive the course email for this assignment, but after reaching out to @alexruthmann on twitter I was quickly pointed to the archive of course communications. I haven’t received emails from my group for the last week, and haven’t received – or given – feedback on the second assignment. Hopefully this’ll be fixed soon. 2) Pasting my URLs into WordPress didn’t work for some reason – the string after the # was being removed when the page was viewed. As that’s the bit that stores the information of my custom mix, this was a bit of a problem. So I used the tinyurl.com URL shortener to handle this for me. I noticed a lot of details with the guitar and drums that I wouldn’t have otherwise heard. I tried to make it a bit like a dialogue between the piano and baritone guitar / bass. I left the backing vocals up a tiny amount, but I don’t think you can hear them.